Recently, many people from the elderly to the little kids are riding a kind of small transport on road and its name is Fosjoas U1 mini electric unicycle. It represents the technique progress of Fosjoas and also infuses new blood into transport world. What makes Fosjoas U1 mini electric scooter a transport for all people? The following is going to explain why. According to the contour, it is really simple. Fosjoas U1 mini self-balancing scooter is made up of two small tyres, an adjustable saddle and scooter body. Small figure paves the way for going through even a little corridor and thus the application occasions are much wider. People can ride it on crowded streets, every corner of park, busy shopping mall or even quiet library. Meanwhile, the appearance of Fosjoas U1 mini self-balancing scooter is really exquisite and fashionable, which fascinates many people. An adjustable saddle plays an important role when it comes to why all people can ride Fosjoas U1 mini electric scooter. Generally speaking, an adjustable saddle has three applications. 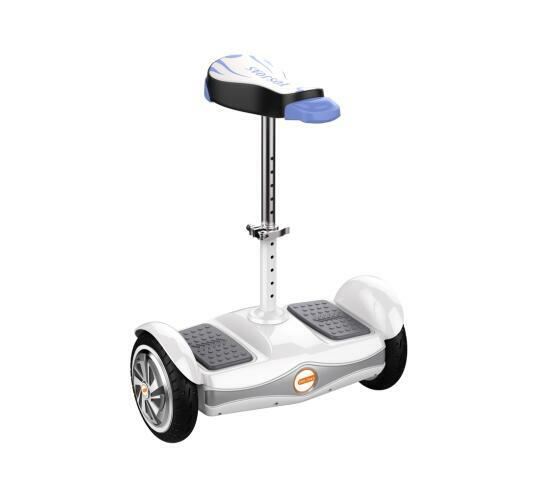 First of all, people can adjust saddle to the comfortable height and sit on it to ride Fosjoas U1 electric scooter if they are riding for a long time and feel exhausted. Secondly, most of the elder riders prefer to choose sitting-posture riding mode because of limited physical strength and inflexible limbs. Thirdly, if riders want to have a better and wider view, they can adjust saddle to the lowest point and ride it by standing-posture. As to saving energy and labor, Fosjoas U1 self-balancing electric scooter is second to none. On the one hand, all controls rely on adjusting body gravity and thus riding becomes very relaxing. On the other hand, like other Fosjoas electric scooters, U1 mini self-balancing scooter costs only 2Kwh per 100km and it is the number one energy-saving transport.